Hurricanes, named after the ancient Mayan god of wind, are known as the greatest storms on Earth. Referred to as typhoons or simply cyclones in other parts of the world, they develop under different conditions than an average storm. Regardless of their ultimate size or intensity, all tropical cyclones start off as a tropical disturbance – an unorganized cluster of thunderstorms – over a large body of warm water. These convective storms generate a column of rising air and an area of low pressure. As moisture-laden tropical air sweeps in to fill the low-pressure void, the storm grows and its winds strengthen. Rising upward, the incoming humid air cools and causes water to condense which releases huge amounts of latent heat. This newly freed heat causes air to rise up even further, producing more condensation and extracting additional heat. Through this process the storm system is able to continuously fuel itself. Subject to the Coriolis Effect, a mature tropical cyclone is essentially a spinning collection of thunderstorms. 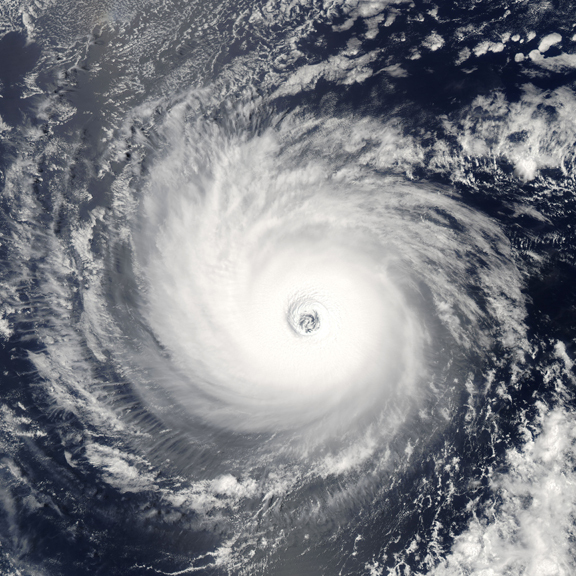 Once designated as a hurricane, the storm is ranked on the Saffir-Simpson Scale according to its wind speed. A hurricane’s strongest winds are found in the eye wall, the area that surrounds the storm’s calm eye and point of lowest pressure. Numerous tropical disturbances develop every year, but only a few grow into full-blown hurricanes. According to NOAA, an average of six hurricanes develop in the Atlantic Ocean annually. This entry was posted in weather and tagged hurricanes, storms, WRN by Melissa Fleming. Bookmark the permalink.